At my core, I’m an artist. Long before Photonics existed, I was a guy with a camera and a passion for capturing unique stills, developing them in a dark room, and sharing the images with those around me. It’s a passion that took years to cultivate and it’s one that I still very much enjoy relishing in today. Upon graduating from Syracuse University (in a year I will not mention), I began working for a commercial photography studio in Greater Cincinnati, eventually partnering with two photographers to start PhotoDesign. At PhotoDesign I photographed for a wide range of clients and was specifically interested in photographing people. Most of my work was done in studio as I preferred being in control of the environment – everything from the lights to the backgrounds to angles took careful planning. Plus, it was always risky to leave the studio with our Cincinnati weather. While at PhotoDesign I also specialized in creating special effect images for a wide range of advertising agencies, design studios and corporations. My special effects often involved multiple images collaged together. 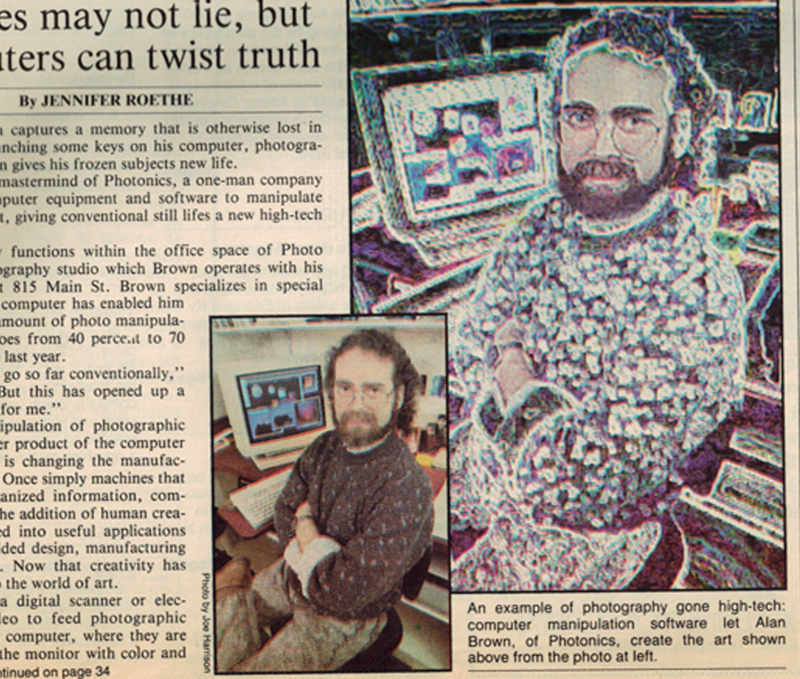 There was no such thing as Photoshop, and computers had just barely been born, so I spent many hours handcrafting the unique images I wanted to create. As a perfectionist I was always looking for a better way to do my special effects. When the Apple Mac came out, it looked like I might be able to use a computer to help me. I bought my first Mac in 1985 and the color Mac in 1989. At this point you could say, "And the rest is history." That first Macintosh, which still sits in our studio today, allowed me to combine my love of art and photography with my curiosity for technology. I have always been interested in how technology can help further creative minds, and that computer allowed me to create images of which I had only dreamed. It also pushed me to open Photonics, formerly Photonics Graphics. When I started this company, we worked with businesses and organizations in Cincinnati to develop graphics for them – logos, printed materials, illustrations. I often chased the latest technology, which gave me a competitive edge and the ability to react nimbly to each new wave of skills that were required by new products and ideas. When the internet was born, I correctly guessed that websites would eventually become a mainstay among our other offerings. Fast forward a few years – 2016 is our 27th year of serving the Cincinnati community’s design needs. While our tools are a far cry from that first Macintosh, our desire to create incredible art has never wavered. I’m proud to work with my team of designers and developers to challenge the status-quo and deliver work that we are proud to share in our community. While we have moved away from photography as a service offering, I still enjoy pulling out my camera on special occasions, when my wife and I travel, or sometimes when the moment feels just right. My tagline on Instagram (@alanbrownone) is "Never a purist, always an explorer."